Tomorrow is Christmas…the day when believers worldwide celebrate the birth of one small child who changed the course of humanity. Usually on this day we hope for at least a few hours of peace in the world…a laying down of arms if you will…but in today’s volatile world so changed by those out to kill us all, peace might allude us even for a precious few hours. Peace might allude us as those even in our own country who don’t honor the one true living God do everything they can to take Christmas away from believers. But try as they might the Christmas spirit remains in the hearts and minds of most Americans for ‘We the People’ know that America was, is, and will always remain a Judeo-Christian nation founded upon a belief in God the Father, His Son, and on the Jewish patriarchs who came before. 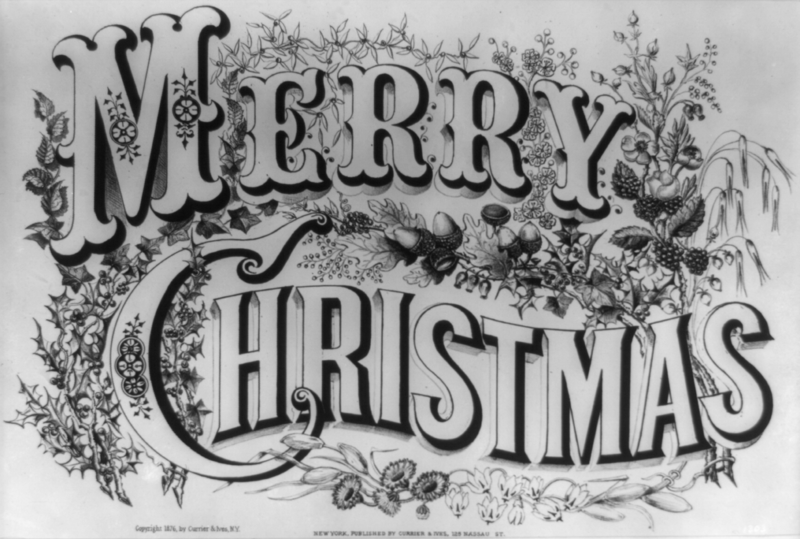 Christmas did not become a nationally recognized American holiday until 1870. Before then Christmas celebrations were frowned upon in certain northern regions of America, because people associated the grandeur of Christmas pageantry with the European monarchs they so opposed. 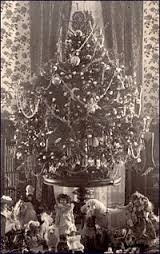 But by the 1880s, Christmas more as we know and celebrate it began to appear when President Benjamin Harrison decorated the first indoor White House tree with candles and toys. In 1894, President Grover Cleveland added electric lights and off and running a White House Christmas went. And from the very moment that the first electric Christmas lights were turned on, Christmas as a national celebration took off all across our land with all the trappings of lights, trees, carolers, gift exchanges, and with a hope that the coming New Year would always be better than the year before. 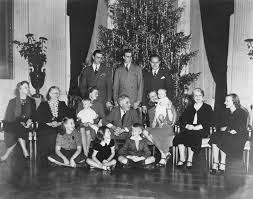 And most of our presidents loved Christmas…they reveled in Christmas traditions, family, and friends, and the true meaning of Christmas was NOT lost on them…like it is on the current occupants of the White House. And for many of our presidents and their families choosing the right Christmas Card was very important for their wishes set the tone for the holiday. 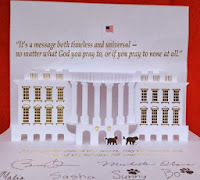 For example, in 2001 First Lady Laura Bush…back when our First Lady was indeed a Lady…sent out official White House Christmas cards with a verse of Scripture (Psalm 27) printed upon them…a Scripture verse she chose mere days after 9/11. The card simply said, “Thy face, Lord, do I seek. I believe that I shall see the goodness of the Lord in the Land of the Living” Powerful words in the aftermath of tragedy…powerful words to help console and comfort a grieving nation…powerful words so appropriate on Christmas Day. And so many of the Christmas cards sent showed the true inner character of the president who sent them. Abraham Lincoln requested that cartoonist Thomas Nast create a special Civil War themed Christmas card to honor those fighting and those now gone. Dwight D. Eisenhower created personalized cards when he himself painted six of the eight Christmas gift prints that he gave to his White House staff each holiday season. And our beloved Ronald Reagan put a line from one of his speeches onto his first Christmas card as president that sums up the true meaning of Christmas, “The greatest gift we can give each other is the gift of ourselves.” In other words, Reagan spoke of helping his fellow man…NO fancy gifts needed. But sadly, John F. Kennedy ushered in the ongoing era of political correctness when in 1961, his official Christmas card said “Season’s Greetings 1961” on the cover and only on the inside did it say Merry Christmas. 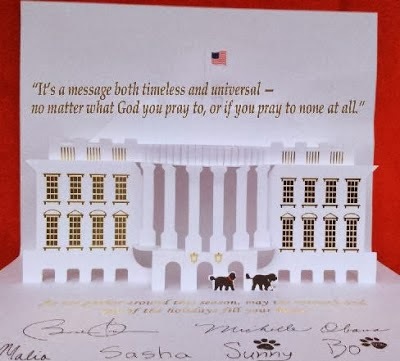 And the Christmas cards he sent to world leaders had a generalized New Year’s greeting that did NOT mention the word Christmas at all…sad indeed. However, that same year, First Lady Jacqueline Kennedy began the tradition of selecting a theme for the official White House Christmas tree, and each year since then the themes have varied with the First Ladies wishes. But Laura Bush’s 2008 ‘A Red, White and Blue Christmas’ was especially touching as it was inspired by letters from everyday Americans that began arriving at the White House soon after September 11th. Many suggested that the White House have a red, white and blue Christmas theme…and they did…honorable folks the Bush’s were and still are. But obviously some Christmas’ were rightfully bleak, for in times of war revelry was toned down. And this was the case during the FDR years. During the Depression and into World War II, Roosevelt would gather his family and friends to come sit before the White House tree as he read Dickens ‘A Christmas Carol’ to them. And while FDR kept the glitzy celebration aspect to a minimum, his simple action of reading a story spoken from the heart was in keeping with the true meaning of the season. And these but brief glimpses of past presidential Christmas traditions and cards all lead up to this current president, whose official 2013 White House Christmas card with its stark white pop-up picture of the White House totally undecorated in Christmas splendor said, “It’s a message both timeless and universal-no matter what God you pray to, or if you pray to none at all…as we gather around this season, may the warmth and joy of the holidays fill your home.” NOT a word said of Christmas…NOT a word said of God…NOT a tree or a Christmas decoration in sight…from the man who professes to be a Christian whose very words say he’s anything but. So as this man who is the epitome of all the vileness that is the hallmark of political correctness…as this man who is NOT a man of God…and as this man willfully chooses his words so as NOT to honor the true meaning of Christmas jets off to Hawaii with his family…on our taxpayer dime…to once again spend Christmas on the golf course slipping pina-coladas NO doubt…it’s obvious he’s running far away from both the religious aspects of Christmas and from all the problems he built, owns, and dumped on ‘We the People’ this Christmas season. And so I would like to wish all who celebrate the birth of the Savior a very un-politically correct ‘Merry Christmas’ filled with peace, love, and joy. And may the New Year bring us back to God and Country for our America will survive because our America must survive…it is that simple.